Apple Breaks Resistance of Big Five Banks in Canada; Debit Scheme Interac among TSPs to Tokenize Cards | NFC Times – Near Field Communication and all contactless technology. Apple has broken the resistance of Canadian banks to participating in Apple Pay, signing up the big five to support the mobile payments service with credit as well as debit cards–the latter through domestic scheme Interac. Canada’s Largest Bank Combines Cloud with SIM; A New Model for the NFC Ecosystem? NFC Times Exclusive Insight – Apple has cracked the big five banks in Canada, with two of the country’s largest banks, including Royal Bank of Canada, today announcing they are participating in Apple Pay, with the three others to follow. The launch announced today is also a first for a domestic debit scheme, Interac, to participate directly in Apple Pay, which means the scheme is believed to be the first to tokenize cards for Apple Pay outside of major international networks, Visa, MasterCard, American Express, China UnionPay and Discover Financial Services. Besides Royal Bank of Canada, or RBC, Canadian Imperial Bank of Commerce, or CIBC, is also among the big five that launched with Apple Pay today. Both banks are making their Visa- and MasterCard-branded credit cards and Interac-based debit cards available. Smaller issuers Canadian Tire Bank and ATB Financial have also launched today with their MasterCard-branded credit cards. 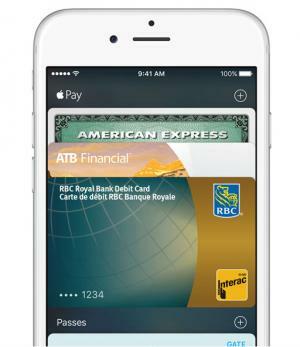 They join American Express, which was the lone issuer participating in Apple Pay in Canada starting in November. Article has about 1820 words.